I was standing and it felt like a hard surface underneath. 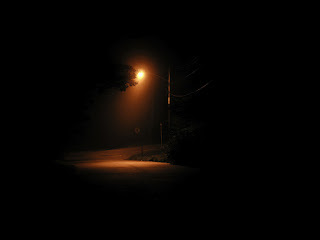 Darkness surrounded me and my eyes were trying its best to adjust to the dim light from a street lamp few meters away. “Where am I” I asked. Though I could see a shady shape, maybe a person perhaps standing next to me, nothing at all was clear. “In front of my house” a male voice answered me, it wasn’t a familiar one nor was it friendly, “Can we go inside my house” he asked me. His house, I don’t remember going to any ones house. I looked around but it was pitch black all around and all I could see was the lone street lamp bathed in its dim yellow light. 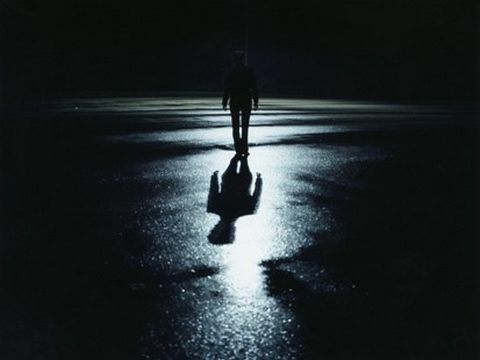 “Who is he” I wanted to ask him but I didn’t, instead I answered him “You go on, I will be there in few minutes”, I watched as he moved into the darkness and disappeared. Now I can see where I was standing, right at the centre on a tar road and all alone in the darkness. It was then it came to my notice, an arch way at the end of the road and a few steps behind the street lamp. It wasn’t there before or is it that I didn’t notice it earlier. “No, it wasn’t there” a simple arch structure covered in small shining cherry red tiles. It shinned beyond the yellow lamp light thus making it magical and was welcoming me to it. If it was there earlier I wouldn’t have missed it by any chance. Before I could knew I already started walking towards it and was now right in front of it. I stood there for some moment mesmerized by its beauty. The arch lead to a way in which single tiles are paved one after the other to form a single straight path. The tiles were smooth and shiny, and resembled a wonderful painting made of cherry red and black colours. Somehow the path was lit by enough light to show its beauty and smoothness. At the end of the path there were wooden handrails which lead down. I put my foot one after the other and started walking slowly towards the rails. Now I was only a step away from the mysterious looking wooden rail and was curious about what I might find down there. I reached for the rails; suddenly a bright white light engulfed me. I closed my eyes tight as the light was so intense. When I opened my eyes again there wasn’t any light instead it was darkness all around me. The beautiful arch, shiny tiles, wooden rails everything has disappeared. I couldn’t see, hear or feel anything; it felt like that I don’t have air around me to breathe. I searched for the rails so that I could hold on to them but couldn’t find it. “I need to move forward” I thought and put my right foot forward. To my surprise I got bounced of the surface, moved a bit in the air and made a gentle landing. The ground was hard but it felt there was little gravity on it. I made another step and the same happened again. Now I got curious, I stamped both my foot hard on the ground and got bounced upward. “I am flying” I said to myself. The warm air passed by kissing my entire body and giving me Goosebumps. “I am flying” I said it again and again. Is this the most wonderful feeling one can have, I felt calm and relaxed; I closed my eyes, opened both arms wide and put my chin up so that I could relish the freedom of flight. It started to fade and was fading into blankness. Its then only I felt it, I was dreaming and was going to wake up soon. It felt great; I was free, free from all bonds and had never felt so happy to be all alone. I tried harder and harder to hang on to the dream. “I don’t want to wake up” I thought; I wanted to be in the dream for ever. “No, I don’t want it to be a dream; I want it to be real”. It felt real but it wasn't and I woke from a strange yet beautiful dream. Now I know what real freedom is, it is the thing that I can imagine but never achieve.